The convent guard was injured. A statue of Our Lady of Lourdes was destroyed in Kolar. 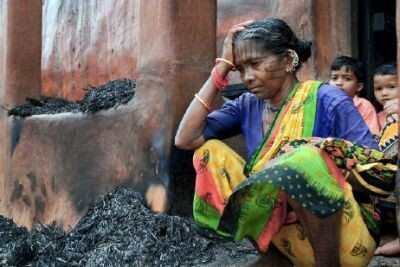 In the state of Orissa alone, 45 have been killed, 5 are missing, and 18,000 have been wounded. Mumbai (AsiaNews) - The guard at the Carmelite convent in Banduha (Ujjain, Madya Pradesh) has been wounded while trying to protect the sisters; in Karnataka, the Syro-Catholic church of St George in Ujire was devastated and burned; a statue of Our Lady of Lourdes was destroyed in Kolar. This is some of the new violence against Christians recorded today. All of these attacks took place overnight, or in the early morning. The wave of violence, which began in Orissa three weeks ago, has so far killed at least 45, and wounded more than 18,000. At 1:30 this morning, a group of five people with air guns came to the Carmel Convent in Banduha and wounded the guard, Amar Singh, shooting him three times. He is in the hospital, and is not in serious condition. Amar Says that "the culprits asked me to call the sisters but I told them that they were not available. They beat me and asked me to cry loudly so that sisters would come out. They shot me with air guns when I disobeyed, and went away". One of the sisters, Sr Dhanya, says that four days earlier, a group had surrounded the convent making noise and shouting slogans, but the guard chased them away. The police have opened an investigation on the incident. Last week a church was burned in Ratlam. But the police attributed the responsibility to the guards. Fr Anand Muttungal, spokesman for the bishops of Madya Pradesh, affirms that these incidents are not random: "in Madhya Pradesh, there is a series of attacks taking place here. It is always done with different methods; we are in touch with the higher officials and leaders from different socio-political organizations. We are peace-loving people, so violence is not our way of living". In Ujire, at 5 o'clock this morning, a group of unidentified persons entered the Syro-Catholic church of St George. They burned bibles, missals, prayer books, desecrated the tabernacle, destroyed the crucifix, the statues and icons. They also poured kerosene on the curtains to burn the building, but fortunately it did not catch fire. Fr Joseph Valiaparambil, spokesman for the diocese of Belthangady, says "We are peace-loving people. We, the Catholic community, with all like-minded people forgive the culprits and pray for them as our Lord Jesus Christ taught us to do. Ours is a democratic country and all the citizens enjoy equal rights and privileges . . . The violence and brutality against Christians in Karnataka is perpetrated on the basis of false ideologies and distorted notions that violate the very fabric of democracy and the spirit of the constitution of India". Early this morning, a replica of the grotto of Lourdes was also attacked, near the church of St Mary, in Kolar. The culprits broke the statue of the Virgin Mary and the panels protecting it. Christians, Muslims, and Hindus all venerate the statue of the Virgin Mary. The custodian and cleaning person at the grotto is a Hindu woman. On September 14, 20 churches were attacked in Karnataka. The police are accused of not preventing the attacks, even though they knew about them. Catholics have organized demonstrations to criticize the attitude of the security forces. In many cases, police savagely beat the faithful. The new wave of attacks against Christians and their institutions began in Orissa, after Maoists ordered the killing of radical Hindu leader Swami Laxmanananda Saraswati on August 23. Hindu fundamentalist organizations accuse the Christians of being the authors of the assassination, and for this reason launched a pogrom, killing and wounding the faithful, destroying and burning churches, schools, social centers, homes. From Orissa, the violence is spreading to Madya Pradesh, Karnataka, and Kerala. According to the All India Catholic Union, so far the violence in the state of Orissa alone has killed 45 and wounded 18,000; 5 are missing. 56 churches, 11 schools, and 4 NGO offices have been destroyed; 300 villages have been attacked; more than 4,000 homes have been burned or destroyed, forcing more than 50,000 people to flee. Of these, 40,000 are still hiding in the forest; 12,000 are sheltered in the refugee camps provided by the government. Widow of Graham Staines: "Do not give up hope, pray for India"